The new Scraper Test Drive stage is on, called CAPTCHA. What can the scrapers perform to get through the “robot fighters”? The off-the-shelf scrapers are not designed for CAPTCHA solving by default. Furthermore, some stated that “bypassing Captchas was compatible with Internet good ethics”. I agree with this, but for the full Scraper Test Drive taste, we still want to try out the scrapers. The Draggable and ‘Drag & Drop’, 2nd and 3rd CAPTCHAs. Send this number in a POST parameter named “captcha” when submitting the form. That’s it! More on these poor reliable CAPTCHAs you can read here. Here are the overall results for the off-the-shelf scrapers solving CAPTCHAs. Basically Visual Web Ripper did the image recognition CAPTCHA (1st CAPTCHA) through connecting to the 3rd party service. The 2nd and 3rd ones can be solved with sending a POST submit form which is kind of complicated for a common user task. Add a content element that selects the CAPTCHA image. Then use the Misc options tab to uncheck the Save content option. Add a FormField element that selects the CAPTCHA input field. Then use the AdvancedOptions tab to select the image element as a CAPTCHA element. Add a FormSubmit template that submits the CAPTCHA form. You may need to set the Misc option to Optional template if the CAPTCHA form is not always displayed. The default decode CAPTCHA script is designed to work with the www.deathbycaptcha.com service. If you are using this service, you only need to add your login name and password. A decode CAPTCHA script can be written in C# or VB.NET. I have no account at deathbycaptcha.com, but I got the trial account from bypasscaptcha.com. So I needed to change the script, leaving its shell (title, input and output) untapped. I downloaded the C# API from bypasscaptcha.com and started to bind it to Visual Web Ripper. It took me a while (you really need to know C# language), but the “Compile and Validate Script” function with corresponding button was a great help. The script does need a valid service key. Note: In some cases CAPTCHA might be given unexpectedly as the extra anti-bot page/screen (after a robot has processed several hundred pages). In this case neither semi-automatic nor fully-automatic CAPTCHA bypass projects can be composed, since it’s not evident what and where a CAPTCHA is. Add a page transformation element that adds or modifies the CAPTCHA form, so that it submits the required values. Since the CAPTCHA test has become an issue with the most of the scrapers, we want to share more on the cases which do not fit the test requirements (fully automatic solution), however it might also help to share on the special features for semi-automatic passing. VWR provides for semi-automated data extraction. It means that when the CAPTCHA puzzle is encountered, the project is paused and the user is prompted to manually solve the CAPTCHA and continue the project execution. Such a CAPTCHA demo project is available for registered users. Visit this link (for registered users only) to see the simple steps to compose such a project and/or download the demo project. Note: A registered user is also one having a trial account. This kind of extraction can be done only in the Web Browser mode with the options “View browser” and “Debugging” checked. Create a new project and load the CAPTCHA page. Switch to Navigation mode and manually process the CAPTCHA. You’ll now see the text “THE FORM WAS SUCCESSFULLY SUBMITTED”. Add a Content element that extracts the text “THE FORM WAS SUCCESSFULLY SUBMITTED”. Edit the Content element and open Advanced options. Set the option “Pause when missing”. Run the project and make sure “View browser” and “Debugging” is enabled. The project will now load the CAPTCHA page and pause. Manually process the CAPTCHA in the web browser. Click the Continue button in the VWR debug window. The project will now continue and extract the content. Visual Web Ripper, being a powerful scraper, completed the character recognition CAPTCHA, while for the draggable CAPTCHAs, it requires some extra coding to solve these event-driven CAPTCHAs. As we’ve mentioned the Drag-&-Drop and Draggable captchas are JS captchas, solvable thru GET and POST requests. So we just need to create “Navigate URL” Content Grabber commands to execute those requests. Note: It’s possible to do this without any scripting, but you’ll end up with quite a few commands for something that’s easily done with a small script. For the “Drag and Drop” Captcha we got tech support help, they’ve provided us a custom C# script to insert into the command. The command uses a very simple data provider script to post the required values and retrieve the number which it then used to generate the final URL. Note: It is the post= parameter inside of the second URL in the script, that makes Content Grabber to send a POST request with captcha credentials. I’ve followed the software manual to make commands for capturing Captcha image, OCRing it and submitting solved text. To get Content Grabber manual go in the Main menu to Help -> Software Manual. Add the script with your Capthca solving service into the window. I used DeathByCaptcha OCR service. Note, the code scripts for some popular services you may find at the Content Grabber’s software manual, CAPTCHA partition. Now you choose the text input field and make a new command, call it Captcha Code. In this command choose Captured data as Data provider and Captcha as Data Column to be a feed into this field. Save the command. After that you choose Submit form button to make a Navigate Link command and save it. As soon as I opened Helium Scraper I turned to Premades since I knew that the developers have done many useful things there. Just go to File->Online Premades -> Communicate with DeCaptcher to import the premade projects. There they provided two projects to easily communicate with the third party De-Captcher.com service in order to automatically solve CAPTCHA codes. However the service which we reviewed uses the Optical Character Recognition system, thus it’s only applicable to the test’s first kind of CAPTCHA solving and is not applicable to events-driven CAPTCHAs solving. found or until the maximum amount of attempts has been reached. The Helium Scraper passed the image recognition CAPTCHA. For these tricky event-driven CAPTCHAs we contacted scraper support. Our inquiry inspired the support team to write a new premade called Simulate DragDrop (now available for the updated version). It simulates a drag-and-drop action from a source element into a target element. You can find it at File -> Online Premades. Also a Boolean Text Gatherer (Project -> Boolean Text Gatherers) was created that helps the CurrentThing kind identify the element it needs to select, which is the item you’d drag-and-drop for the AJAX FANCY CAPTCHA. Among the other scrapers, Helium Scraper did this task with the least amount of time and power consuming, if one does not take into account the creation of a new JS gatherer and the additional boolean element by the support team. If one runs the scraping session on the workbench, the script does just pop up the CAPTCHA for a manual fill-it. The workbench is only to develop the routine, and once done, the script can be run in the server mode, and that script will submit CAPTCHA to the service. As far as the drag & drop CAPTCHAs, Screen Scraper is able to send the POST requests, so basically the scraper is able to solve these CAPTCHAs when additional scripting is added. This scripting must imitate the HTTP session in order to reproduce the requests that we described in the Bypass by sending POST submit form paragraph. Go to Screen Scraper Documentation and inquire for the “POST request” term for further reference. This scraper is for purely straightforward scrape. So even though I tried my best I failed to find any way for automatic CAPTCHA solving through Web Content Extractor. Yet at the last minute the support provided the project for semi-automated CAPTCHA solution. Upon the project run one needs to enter CAPTCHA text manually or make a ‘smart move’ and click “Submit form”. This solution does not meet the Scraper Test Drive requirements, yet we mention it as the only given way and render some point for it. At this time, Mozenda does not support automated or manual workarounds of CAPTCHA. After a short search for the CAPTCHA solving techniques, I found that this scraper is not designed to do this tricky task. In this project the support has helped us how to use an automator, called scraper, in Outwit Hub. Since in the ‘Drag & Drop’ CAPTCHA the index of the item for drag & drop is obvious in HTML (followed with ajax-fc-highlighted ui-draggable class names; see a picture below), why not scrape it, save into a variable and send it in the POST request? #variable#<VariableName># directive declares and sets the value of the variable (<VariableName>). Occurrences of the variable are then replaced, at run time, by the scraped value. So we defined the variable named position and the scraper will scrape the digit (\d – regex) prior to the Marker After (see the picture below). #nextPage# directive allows to tell scraper how to find the link to the next page to use in an automatic browse process. It’s used for sending POST request to solve 3-d CAPTCHA according to what we mentioned about solving JS driven CAPTCHAs. Note, the ‘captcha’ POST parameter is passed with position variable value (see the picture below). Just run (execute) a scraper and do not forget to press “Next Page” or “Browse” button for sending POST request. The scraper has now solved only the last CAPTCHA, yet i believe it will grow up in its skills and strength. Their support promised to configure the agents for CAPTCHA solving but, so far, no reply from them. I do not think this scraper is able to pass CAPTCHA Test Drive. 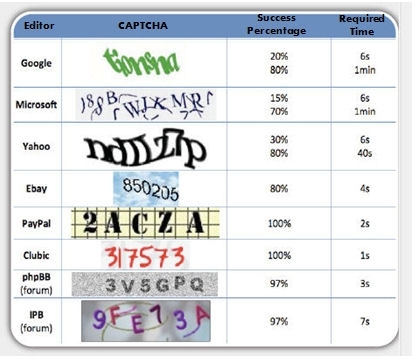 The Test Drive has shown that some of scrapers have developed the gateway to the third party services for CAPTCHA recognition. Also, some provide the scripting opportunity for solving ‘drag & drop’ type CAPTCHAs. Out of all the scrapers you’ve tried and tested what’s your favourite? Also have you tested irobotsoft.com? What do you think of it? We tried all the scrapers we’re talking about. Usually we recommend Visual Web Ripper or if you search for something free then we’d recommend you OutWit Hub. I can tell you nothing about irobotsoft.com since we didn’t try it. Do you which software could solve that kind of dynamic captcha images ? I tried ɢꜱᴀ and decaptcher without success. Ytrezq, I think the captchas that you’ve shown in comment are easy to be solved with modern solving tools. Probably you need to try other software or reconfigure those that you’ve tried. As far as other tools, visit this link. There are also many tools mentioned in that post’s comments. I failed to found how to configure ɢꜱᴀ Captcha Breaker to break that kind of thing. I already know the computing power of a ᴘᴄ of 2008 can achieve 80% of success with 1 min per captcha image with this link http://itpro.nikkeibp.co.jp/article/COLUMN/20081104/318405/ph2_417.jpg. However, I can’t understand Japanese, so I couldn’t found which tool was used to get those kind of results. What I need is the proof that solving that kind of captcha no longer used on Google (recaptcha replaced almost everything) is possible without any human assistance (by using ᴏᴄʀ software). and that a result above 70% is achievable within 3 seconds. ytrezq, I can’t help you that exact (solution probability and timing). Better you address this question directly to those services’ supports (forums). Some may positively reply you. The problem is I failed to get any replies. 4 worked days seems a bit long for both ɢꜱᴀ and decatpcher. I tried several e‑mail address. I don’t think I will get support. …proof that solving that kind of captcha (no longer used on Google since recaptcha replaced almost everything) is possible without any human assistance (by using ᴏᴄʀ software). and that a result above 70% is achievable within 3 seconds. Ytrezq, how can you get a proof of non-present captcha image solving, especially with probability? simply by describing how to reproduce the proof (software and configuration used along harware). Remember I don’t have it. I’m searching it. The first step is simply to solve those images through ᴏᴄʀ (after that I can tune timing and automate image file retrieval). And this is what I’m failing to do. I think even a tesseract filter could solve allow to solve it with tesseract. However, as with ɢꜱᴀ captcha breaker, I don’t know how to build a filter.